The Felis genus features six cat species including the favorite cat of all, the domestic cat or Felis catus. Felis is a genus of the Felidae family that includes several small and medium-sized cat species including the favorite human pet, the domestic cat. The largest cat of this genus is the jungle cat and the smallest one is the black-footed cat. These animals inhabit a wide variety of habitats ranging from swamps to deserts. They feed on small-sized prey including small rodents and birds. The worldwide population of most of the Felis species, with the exception of the domestic cat, is gradually declining due to habitat loss, poaching, poisoning, and other threats. The rarely photographed Chinese mountain cat. The Felis bieti is a wild cat of the Felis genus that inhabits the north-eastern parts of the Tibetan Plateau in western China. The species lives in coniferous forests, grasslands, and alpine habitats within its range. 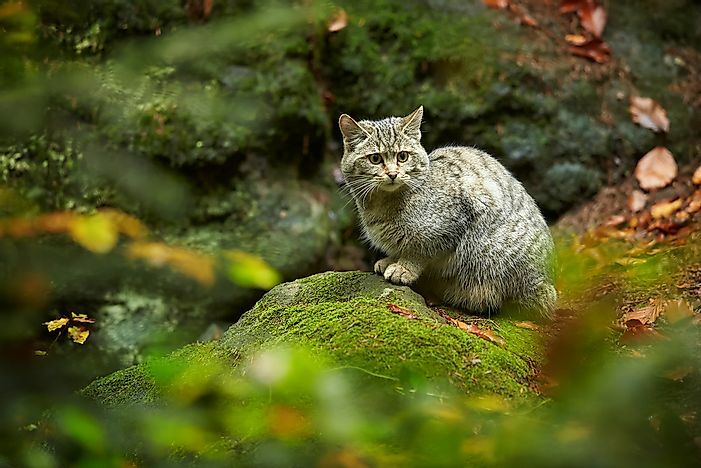 The Chinese mountain cat can be observed at elevations between 2,500 and 5,000 m. The cat has sand-colored fur, black-tipped ears, broad skull, tails and legs with black rings, and a white belly. These animals feed on birds, pikas and rodents in their habitat. They hunt at night and are rarely seen during the day. 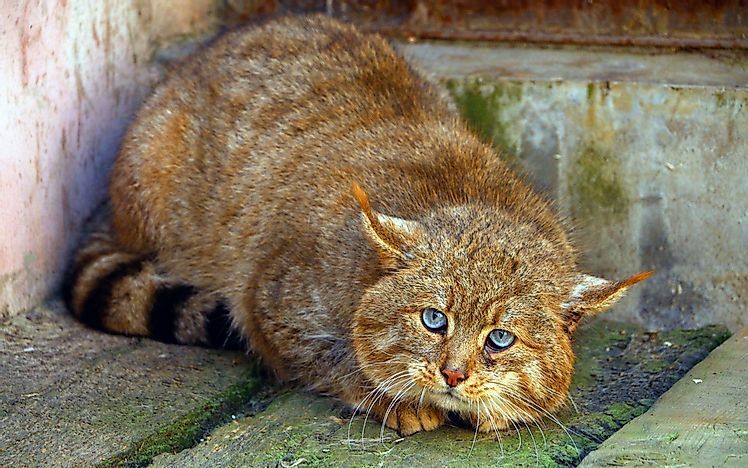 The Chinese mountain cat is a “Vulnerable” species. Poisoning of pikas by humans reduces the prey base of the cats and also leads to poisoning of these felines due to consumption of poisoned prey. The Felis catus is a furry carnivore of the Felis genus that is found in many homes across the world as pets. These animals are treasured for their companionship and ability to hunt vermin. Pet cats are still efficient predators with sharp claws, teeth, excellent night-vision, and a great sense of hearing, picking up sounds that are not heard by human ears. They, however, lack a good color-vision. There are over 70 breeds of domestic cats whose population are maintained by spaying/neutering practices. Domestic cats that are abandoned or stray out of homes forms the feral cat populations. 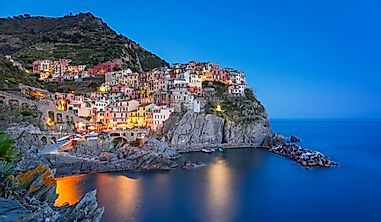 Many countries across the world have a significant population of feral cats. A jungle cat, an example of the Felis chaus species. The Felis chaus ranges in the Middle East, South Asia, southern China, and also Southeast Asia. Within its range, the wild cat prefers habitat with a steady supply of prey and enough water. It is found in swampy areas, riparian regions, and wetlands. The cat is highly solitary in nature and guards its territory by urine spraying and scent marking. The cat is relatively large in size and has long legs. The fur of the cat is a uniform gray, reddish-brown or sandy colored. It hunts by the day and hunts by stalking its prey which consists of small mammals and birds. Mating behavior is similar to that of domestic cats and males pursue females. 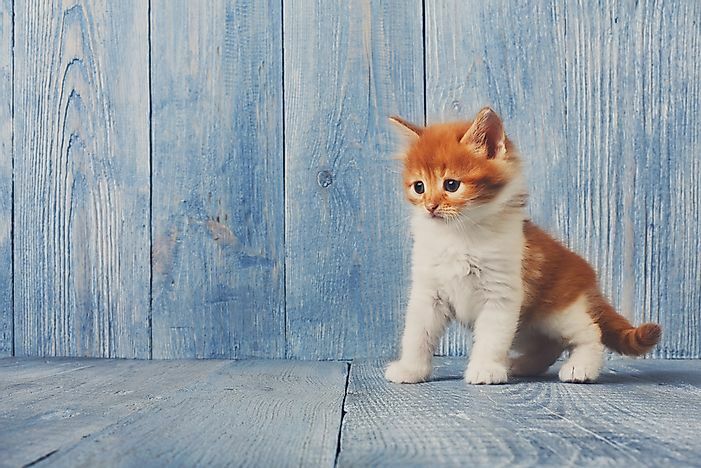 Kittens are born after a gestation period of about 2 months and stay with the mother for about six months to a year after which they lead independent lives. Although the cat is recognized as a “Least Concern” species, estimates reveal that the population of the jungle cat is steadily decreasing due to poisoning, hunting, and habitat loss. The Felis margarita is the only species of Felis that lives in true deserts. These wild felids can be found in the deserts of the Middle East, Central Asia, and North Africa. The relatively small cats have a pale sandy colored coat with or without stripes and spots. The tail has dark rings alternating with buff-colored bands and a black tip. The short limbs have blackish bars. The furred feet helps the cat in adapting to the desert environment. 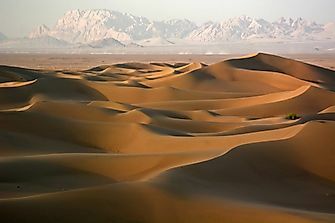 The sand cats occur in both sandy and stony desert landscapes. 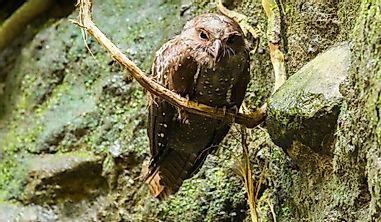 The species is further subdivided into four subspecies: F. m. margarita, F. m. thinobia, F. m. scheffeli, and F. m. harrisoni. Sand cats live in burrows dug by other animals and feed on rodents and birds in their habitat. The cats are nocturnal and crepuscular in nature during the hot season but prefer to stay in the sun in winter. They urinate and leave scents or scratches on objects in their range as a means of communication. 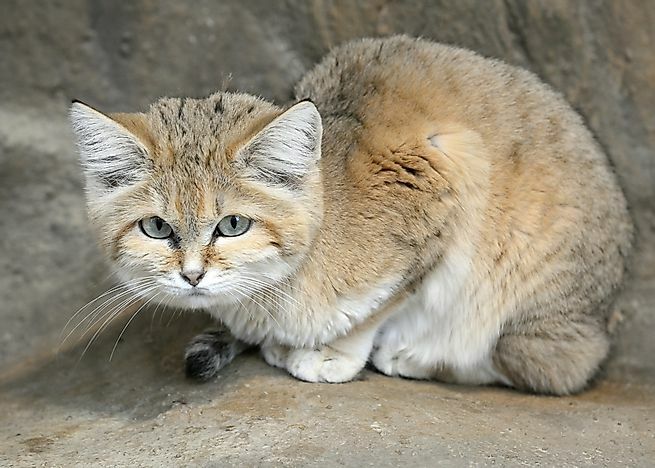 The sand cat is a “Near Threatened” species with a steadily decreasing population. The Felis nigripes is the smallest cat species in Africa and one of the smallest in the world. 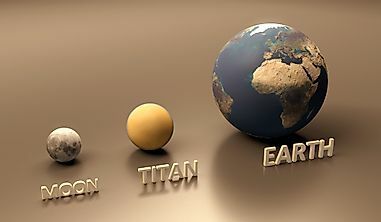 The range of the animal is restricted to the arid zone in southwestern southern Africa. The adult males are about 36.7 to 43.3 cm in length from head to body while females are slightly smaller in size. The fur color of the cat varies from tawny to cinnamon-buff. The cats have black spots on the body which merges to form rings around the neck, legs, and tail. The tip of the tail is black in color. The pads and underparts of the feet are also black colored. The ears are rounded and the eyes are large in size. Also known as the small-spotted cat, the species is classified further into two subspecies: F. n. nigripes and F. n. thomasi. These cats are highly solitary species and act fiercely when cornered. They are rarely encountered by humans due to their strictly solitary nature. 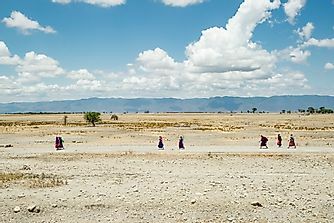 They inhabit semi-arid areas with sparse vegetation and seek refuge in burrows dug by other animals during the day. They stalk their prey stealthily like other felids. Rodents and small birds constitute the majority of their diet. Hunting for bushmeat, traffic accidents, and persecution by humans have resulted in a decline in the population of this species. 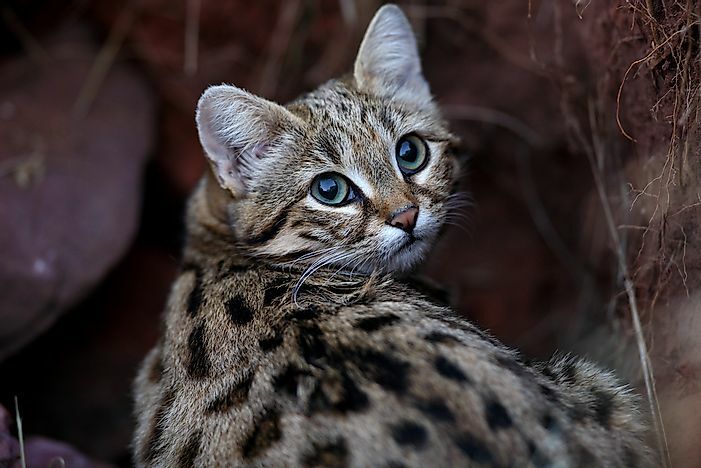 The black-footed cat is thus is recognized as a “Vulnerable” species by the IUCN. The Felis silvestris is a member of the Felis genus that is considered to be the ancestor of the domestic cat. The species is widely distributed in the Old World with its range including most of Africa, Europe, and large parts of Asia. Scientific studies have suggested that the wild cats were domesticated at about 7,500 BCE when humans started practicing agriculture in the Fertile Crescent and the cats preyed on rodents in the farmers’ fields. 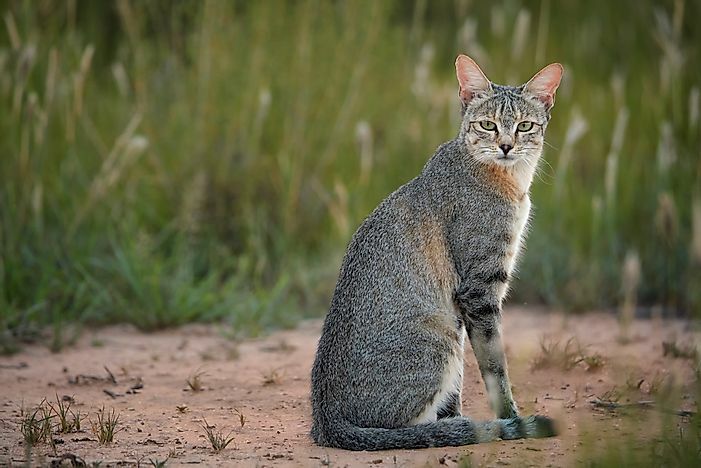 It is believed that the African subspecies of the wildcat, the African wildcat gave rise to the domestic cat as genetic, behavioral, and morphological features of this subspecies most closely resemble that of a housecat. 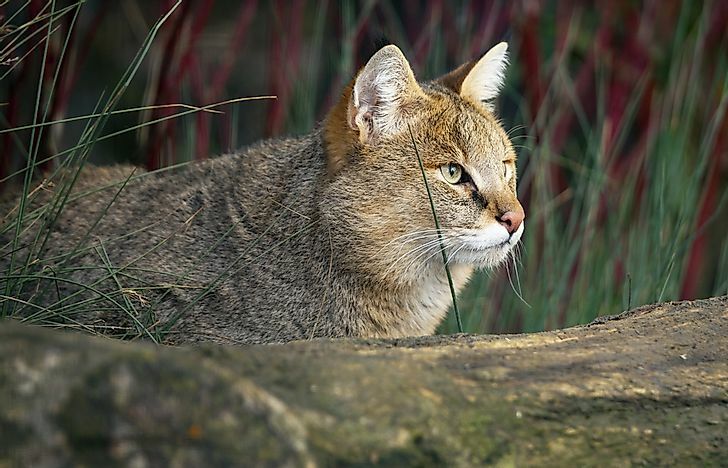 The Mammal Species of the World recognized 22 subspecies of the wildcat which are grouped into the three categories of forest wildcats, stepped wildcats, and bush or bay wildcats.